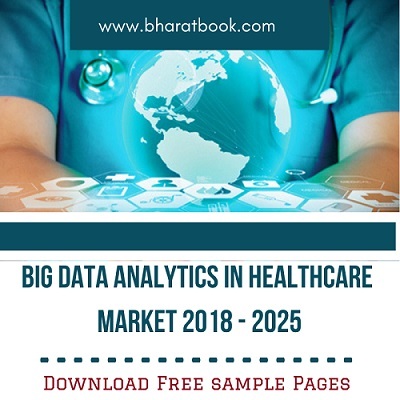 Bharat Book Bureau Provides the Trending Market Research Report on “Big Data Analytics in Healthcare Market by Component, Deployment, Analytics Type, Application, and End User : ****** Opportunity Analysis and Industry Forecast, 2018 – 2025”under Media & Technology Category. The report offers a collection of superior market research, market analysis, competitive intelligence and Market reports. Big data analytics in healthcare is an analytic solution that derives insights on patient information and improves treatment techniques by enabling evidence-based disease prevention modeling and diagnostic analysis. The key players, such as IBM Corporation, Optum, Microsoft, and others, provide innovative analytical solutions such as population health management, biometric analysis, clinical decision support, revenue cycle management, risk assessment, value-based analytics, and others to healthcare end users. In addition, big data analytics optimizes process-oriented expenditures in the healthcare industry by improving the population health, integrating performance modeling with financial and predictive care monitoring, and others. The ****** big data analytics in healthcare market size was valued at $16.87 billion in 2017, and is projected to reach $67.82 billion by 2025, growing at a CAGR of 19.1% from 2018 to 2025. Rise in demand for analytics for population health management solution and increase in adoption of cloud analytics among several end users are some of the major factors that drive the ****** big data analytics in the healthcare market growth. In addition, rise in government initiatives for supporting the adoption of healthcare analytics is expected to fuel the growth of the market. However, security concerns over patient information among end users and slow adoption of healthcare analytic solutions in the underdeveloped regions are the major factors that impede the market growth. Conversely, technological advancements and rise in application areas among various industry verticals are expected to provide lucrative opportunities for the big data analytics in the healthcare market growth. The ****** big data analytics in healthcare market is segmented based on component, deployment, analytics type, application, end user, and region. In terms of component, the market is bifurcated into software and services. On the basis of deployment, it is fragmented into on-premise and cloud. Depending on analytics type, it is segregated into descriptive analytics, predictive analytics, prescriptive analytics, and diagnostic analytics. By application, it is classified into clinical analytics, financial analytics, and operational analytics. By end user segment, it is divided into hospitals & clinics, finance & insurance agencies, and research organizations. Region wise, big data analytics in healthcare market is analyzed across North America, Europe, Asia-Pacific, and LAMEA. The ****** big data analytics in healthcare market is dominated by key players such as All Scripts, Cerner, Dell EMC, Epic System Corporation, GE Healthcare, Hewlett Packard Enterprise (HPE), International Business Machines (IBM) Corporation, Microsoft, Optum, and Oracle Corporation. The study presents an in-depth analysis of the ****** big data analytics in healthcare market along with the current & future trends to elucidate the imminent investment pockets. Porter’s five forces analysis illustrates the potency of buyers and suppliers operating in the ****** big data analytics in healthcare industry. The quantitative analysis of the ****** big data analytics in healthcare market from 2017 to 2025 is provided to determine the market potential.